1. 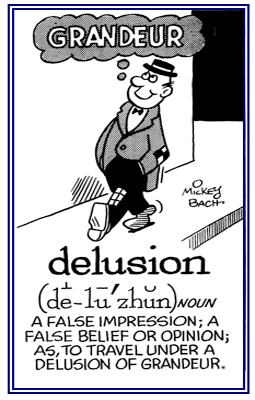 As if in a delirium: "He was talking deliriously." 2. In a delirious manner. 1. Marked by uncontrolled excitement or emotion. 2. The state, or condition, of being delirious; delirium. 1. Usually a brief state of excitement and mental confusion often accompanied by hallucinations. 2. A state of violent mental agitation marked by extreme restlessness, confusion, and sometimes hallucinations; which may be caused by fever, poisoning, or brain injury. 3. A temporary state of mental confusion, fluctuating consciousness, extreme excitement or emotion resulting from high fever, intoxication, shock, or other causes. It is characterized by anxiety, disorientation, hallucinations, delusions, uncontrolled excitement or emotion, and incoherent speech. 4. Etymology: from Latin delirium, "madness"; from deliriare, "to be crazy, to rave"; literally, "to go off the furrow"; a plowing metaphor, from the phrase de-, "off, away" + lira, "the earth thrown up between two furrows, furrow". Delirium tremens is Modern Latin, "trembling delirium"; introduced in 1813 by British physician Thomas Sutton, for "that form of delirium which is rendered worse by bleeding, but improved by opium." 1. Relating to a condition of being concealed or in seclusion: Jim has had a delitescent talent as a skilled writer and there is still no indication yet that he will become an author in reality anytime soon. 2. A reference to the sudden disappearance of a tumor, a cutaneous lesion, or the signs and symptoms of a disease: Karon's illness was in a delitescent condition and so it was not apparent as it had been in the past. The sudden disappearance of Mark's malignant cancer was a delitescent miracle, as far as he was concerned. 3. 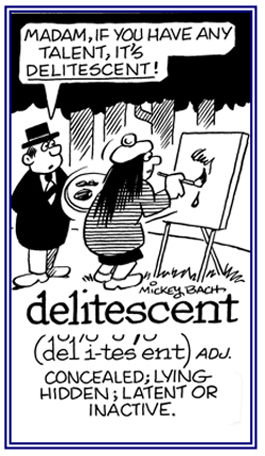 Etymology: from Latin delitescens, present participle of delitescere, "to lie hidden, to be concealed" from de-, "away, under" + litescere, "to lie hidden, to be lacking". © ALL rights are reserved. 1. To deprive of by fraud or deceit; to steal: Mary, the maid, attempted to delude her mistress of a valuable necklace. 2. To fool the mind or judgment of someone, so as to cause what is false to be accepted as true: Nadir's arguments were so impressive and seemingly so true that he completely deluded his audience about the true nature of the medicine he was selling. Agnes said, "If Pedro thinks I care, then he is simply deluding himself." Much of the spam on the internet is done to delude people with some scheme or trickery. 3. 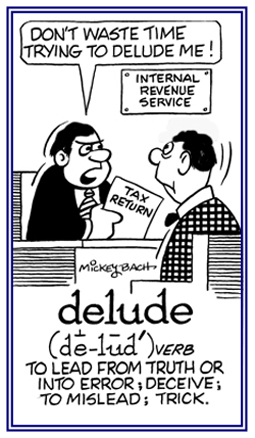 Etymology: from Latin deludere, "to mock, to deceive"; from de-, "down, to one's detriment" + ludere, "to play". © ALL rights are reserved. Someone who deceives or imposes false impressions or ideas: When Jones was brought before the judge for the third time on charges of fraud, the judge commented, "You are a repeat deluder!" 1. A sudden heavy downpour of rain or a torrent of water: After a long dry summer, Steve and Polly enjoyed the deluge of rain that happened on the weekend. 2. A vast quantity or an overwhelming amount of objects in excess; such as, if by a great flood of articles: Jack received a deluge of fan mail from people who saw and loved his movie. For her birthday, Cleo's sister received a deluge of gifts from her friends. 3. Overwhelmed, as with a heavy downpour or vast amount of some matter: According to ancient accounts, the northern nations did not anticipate the deluges of the Roman empire with their armies. 4. A great quantity of something, inundated; submerged: The deluge of rain caused severe mudslides. 5. 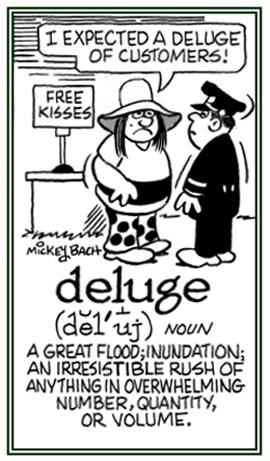 Etymology: from Old French deluge, earlier deluve; from Latin diluvium, from diluere, "to wash away"; from dis-, "away" + -luere, a combining form of lavere, "to wash". © ALL rights are reserved. 1. 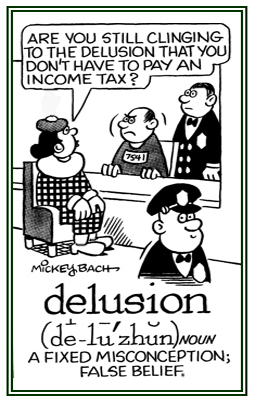 A false idea, belief, or opinion that is contrary to fact or reality, resulting from deception or a misconception: Harry labored under the delusion that he would be successful as a salesman. 2. A mental disorder; a false belief strongly held in spite of invalidating evidence; especially, as a mental disorder: Mack had delusions of persecution by all women. Kerri had delusions of grandeur as an actress. Sam had the delusion that he was a muscular man as he lifted the weights at the fitness studio. Zachary had a delusion that all women hated him. Tanya had the delusion of being extraordinarily beautiful. 3. 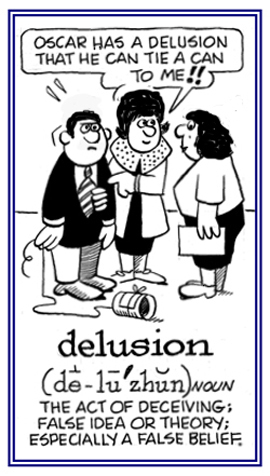 Something falsely disseminated or believed: Technically, a delusion is a belief that, though false, has been surrendered to and accepted by the whole mind as the truth. The investigators were under the delusion that the safety for the workers was a reality; however, since it was based on a report circulated to the supervisors, it became apparent that they were dishonest and it was made in order to avoid any responsibilities for anything that was really going on. Tending to mislead or to fool others: Hank's delusive personality was always getting him into trouble with the police. In a deceptive and unrealistic way: Standing in front of the mirror, Sarina delusively wondered if she were really beautiful. 1. Tending to mislead or to deceive; deceptive: When captured, the escaped convict gave the most delusory explanation about where he had been the night of the crime. 2. Having the nature of and likely to mislead someone: Jennifer was described by the village gossips as having a delusory personality because she seemed to be always trying to get others into trouble. Showing page 24 out of 44 pages of 646 main-word entries or main-word-entry groups.